The Quintana Horse Race is a competition among six knights, each one representing a local district. 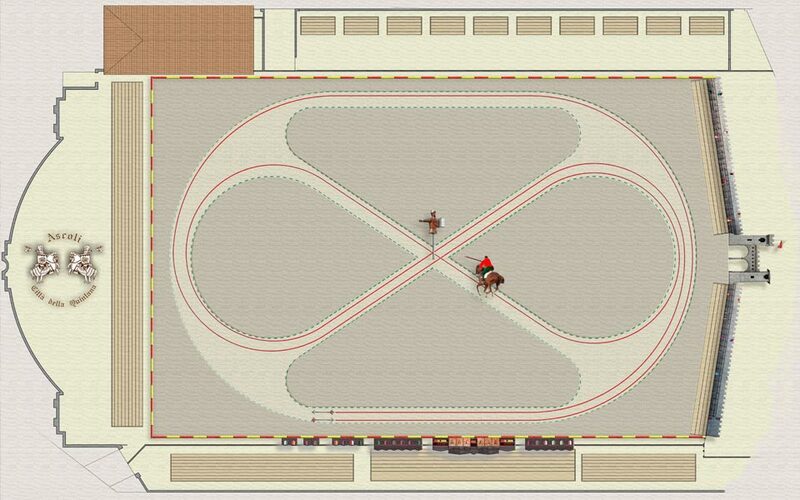 During the race, the knight must use a spear and ride a horse on a 8 shape route to hit the “moro” in the middle. Each assault corresponds to a certain score. The knight has to make 3 assaults in a row for each turn (named “tornata”). There are 3 turns for each knight for a total amount 9 assaults. The most precise and the fastest knight wins the race. The tournaments were a product of feudalism and cavalry and were related to the war-fighting games of many populations, aimed at practicing military art. There used to be many tournaments during the XII and XIII century, both in big cities and small villages. Jousts became even more famous than tournaments from the XIII century and started to spread all around the country. 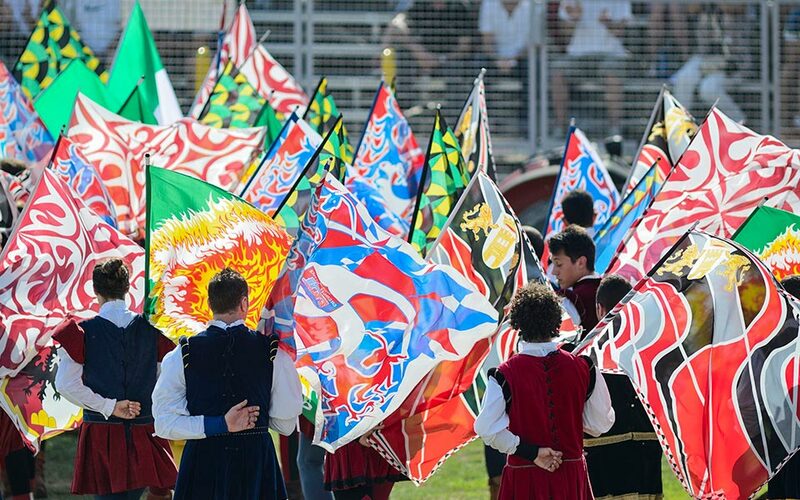 All year round, they train all agonists performing under the starry sky of Piazza Arringo, in the five specialities of the federeal regulation, and now boast national awards and medals that enrich the palmar of the Picenians. 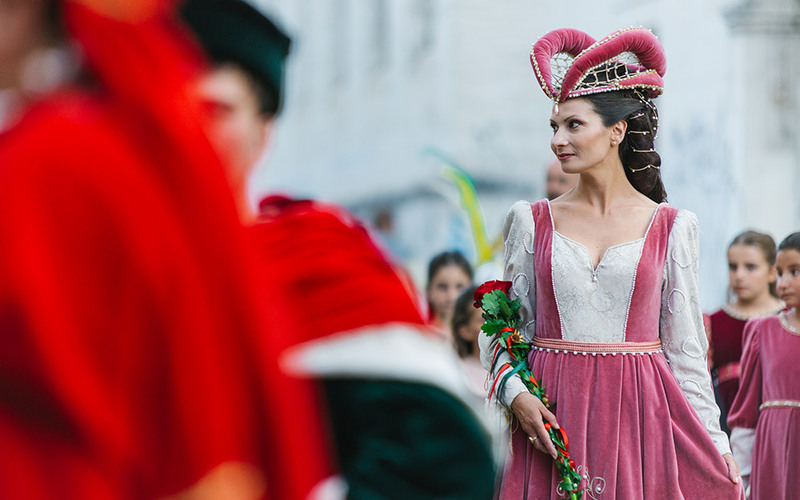 With its 1500 figurines, dating back to the picturesque setting of the historic center of Ascoli Piceno, wearing gorgeous costumes of 1400, the historical parade of the Quintana of Ascoli Piceno stands out for its charm and beauty. In the eyes of the public jump to the eye, increasing the emotion, the beauty of the ladies, the carrying of the armed, the knights and the Magistrature. 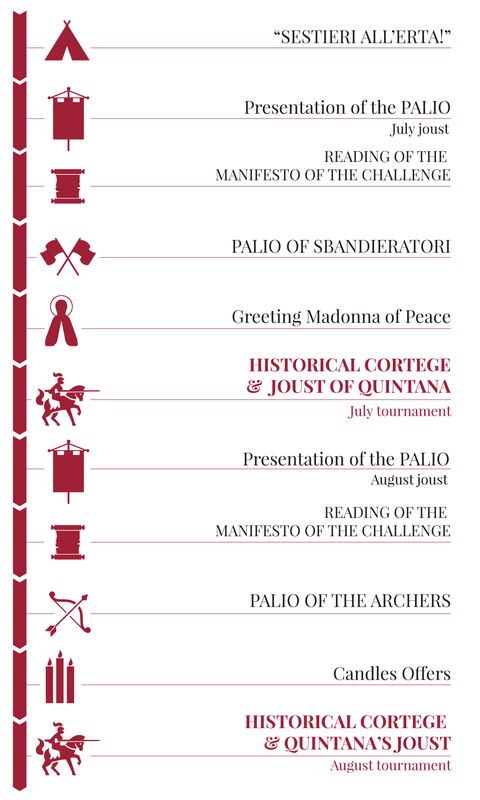 Discover the detailed calendar of the 2018 summer events related to the Quintana of Ascoli Piceno and live the medieval atmosphere of the Picenians culture. The stadium ‘Squarcia’ is closed to the historic center of Ascoli Piceno, in the avenue De Gasperi. After some renovation works, is now used to the Quintana, in particular for the cavalry Joust.